The season for fresh cut flowers is here! 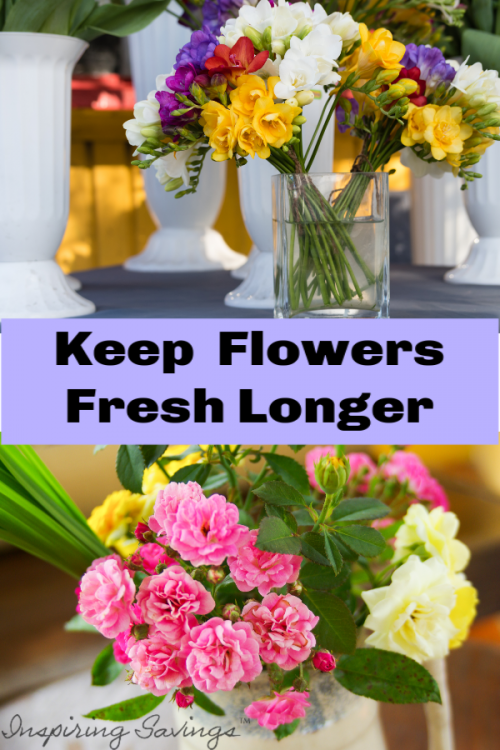 Follow these pro tips for keeping fresh flowers lasting beautiful longer. You’ll be glad that you took the time to do these tips. Allowing you to enjoy your arrangements longer. 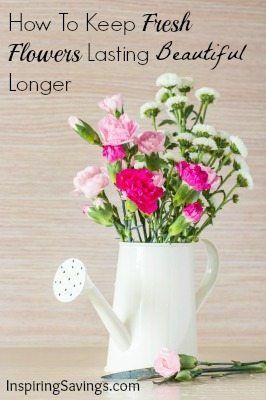 How To Keep Fresh Flowers Lasting Beautiful Longer! Fresh flowers are simply beautiful. Nothing brightens a room quite like a vase of fresh flowers. Even though most bouquets come with a little packet of “fresh keeper”, it often seems like our flowers are still not lasting as long as we would like. I have found that even with the use of that little packet flowers start to wilt in just days. What gives? My Aunt Rose is a professional florist. I had a chance to sit down with her and ask for her professional tips. 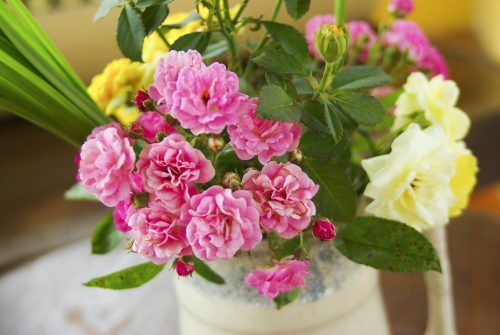 Her expert tips will help keep your flowers lasting beautiful for much longer. As a rule of thumb, professional cut flowers on average will last about a week, after that point they will start to wilt. Carnations and mums last slightly longer since they are a hardier plant. 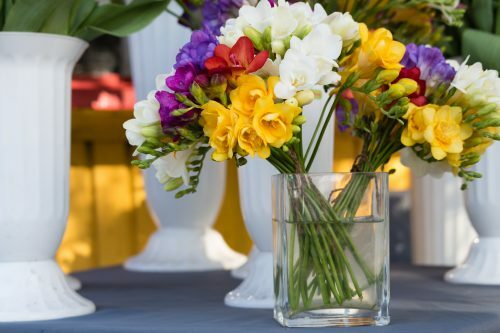 Before you display your flowers in a vase there are some steps you are going to want to do first. If you need to cut the flowers to fit inside your vase. Fill your sink with water and cut them underwater on a 45-degree angle. By removing foliage on the bottoms of stems will help keep flowers lasting longer. Those extra leaves will need water to upkeep, but they don’t add any elegance to your display. Plus any leaves left in water will cause the flower to wilt quicker. Essentially this just makes your bouquet looking fresh. No one wants to leave dead petals on their flowers. If you floral arrangement came with a fresh packet make sure to mix in with fresh water. This little packet is filled with nutrient-rich plant food that will keep your flowers looking beautiful. Did your arrangement not come with a fresh packet? No worries. You can make your own with this quick recipe mixture. Always use a sparkling clean vase that has been washed in hot, soapy water and rinsed well. This will help remove any microorganisms. Next, you want to use warm water to help with absorption and to avoid shocking the stems. Then, let the water sit for a few minutes to let gases in the water dissipate. Now that you have completed all these steps and your flowers are being displayed beautifully, let us go over a few more pro-tips. These tips will help you maintain your arrangement longer. Too much warmth or too little sunlight will make the flowers wilt quicker. Make sure to keep them away from fruits and vegetables. They give off ethylene gas, which will wilt your flowers super fast. FTD florists featured an experiment on their company’s blog, which showed that putting flowers in the refrigerator overnight helped to keep the flowers alive for a longer time. So, if you can fit your flowers in the refrigerator, the cold temperature will help preserve them. I would maybe consider doing this at night time while your flowers are not on display. After all, who wants to keep their beautiful flowers locked up in the fridge 24 hours a day. Not me! If the water gets cloudy, put fresh water and re-cut stems about an inch. Cloudy water means bacteria is building up. I would follow up by adding in the fresh packet or by using the recipe mixture list above. If you have life-extending flower tips that have worked for you, we would love to hear them. Is your aunts name really rose?